The students plan to focus on innovation and entrepreneurship on campus that will lead to change in their communities and beyond. Four students have been selected to represent Texas Tech University as part of the 2017 class of University Innovation Fellows. 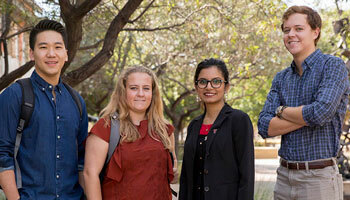 Crystal Blankenship, a sophomore chemical engineering major from Santa Clarita, California; Alvin Kim, a junior computer science major from Los Angeles; Braxton G. Manley, a junior marketing and management major from Austin; and Saba Nafees, a doctoral student in mathematical biology from Fort Worth, make up the newest cohort of Texas Tech fellows. University Innovation Fellows (UIF) is a program of the Stanford University Hasso Plattner Institute of Design (d.school). The program was created by the National Center for Engineering Pathways to Innovation (Epicenter), which was funded from 2011 to 2016 by a five-year National Science Foundation grant. UIF empowers student leaders to become agents of change at their schools. Fellows work to increase campus engagement with innovation, entrepreneurship, creativity and design-thinking. The 2017 Texas Tech fellows are among 169 students chosen from 49 higher education institutions in four countries. Since joining the UIF program in 2015, Texas Tech has had 14 fellows, including the four students from this year. Students chosen for the program undergo an intensive, six-week online training to help them conduct an in-depth analysis of their campus ecosystem and brainstorm solutions and new ideas. They then travel to the annual University Innovation Fellows Silicon Valley Meetup and take part in events and conferences throughout the year. Texas Tech fellows also will interact with students from other schools throughout the year to share ideas and plans to prompt change on their campuses. Past fellows have represented the Whitacre College of Engineering, Rawls College of Business, the Honors College, the College of Agriculture Sciences & Natural Resources and the College of Arts & Sciences. Students are nominated to the program by student leaders, faculty and staff who have knowledge of their commitment to entrepreneurialism and participation in campus courses, organizations and events. The fellows in this year's cohort said though they already are very active on campus, they are looking for ways to grow the innovation and entrepreneurship community to include students from every major. Making students more aware of the opportunities and resources on campus is important for successful collaboration and growth, said Manley, who was recently elected vice president of Tech CEO, the campus business and entrepreneurship organization. Manley said he hopes to inspire students to explore their own innovative ideas that could lead to changes across the globe. Blankenship also is focusing on interdisciplinary collaboration, but with a slightly different approach – categorizing student residence halls according to the things students are passionate about. The hope is these discussions based on interests will redefine the way students choose their major and identify their college experience, Blankenship said. 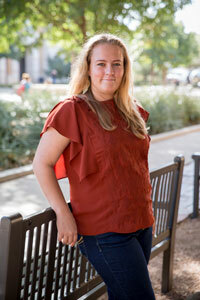 She chose to focus on this topic after completing student interviews and realizing many students separate their interests and majors due to social and financial stigmas associated with certain degrees. “I would like to obliterate those stigmas to create a student body that is encouraged to pursue their passions for a fulfilling and innovative career,” Blankenship added. 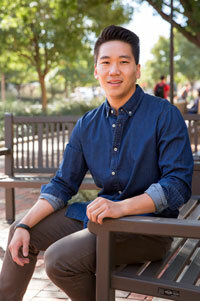 Kim's project while focusing on his hometown, also has its roots in entrepreneurship and innovation. This past summer, he and friends who are former athletes founded a not-for-profit fitness project called The Seed Project | Los Angeles to serve underprivileged communities in the city. Kim said the group is now restructuring to consider the possibilities of the project becoming a non-profit organization recognized by the government and serving even more communities throughout the country. They're also planning the launch of seasonal volunteer projects to allow those who may not have the fitness and wellness knowledge to teach a class, to contribute and help their cause in empowering those who are in need of attention, including those in Lubbock. 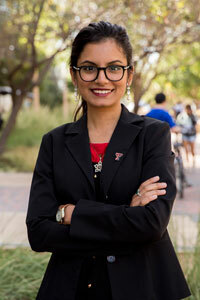 Nafees also is working on implementing a business plan for an idea that won her and her team of fellow Texas Tech students first place at the inaugural Tibetan Innovation Challenge in July. The idea, PATA, is an online point-of-sales system that allows Tibetan handicraft producers to target western consumers. 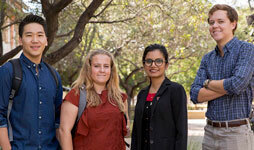 “We traveled to Nepal and India, thanks to Texas Tech's generous support, to conduct market research and now are hoping to turn our idea into a startup that will benefit the Tibetan refugees living in India and Nepal,” Nafees said. 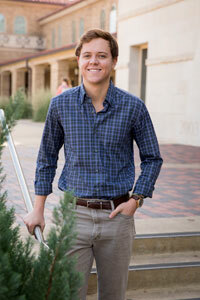 If a student is interested in joining future cohorts, the 2017 fellows suggest getting involved on campus with one of the many entrepreneurial organizations and workshops that exist, like Texas Tech Innovation Mentorship and Entrepreneurship (TTIME), Media Entrepreneurship and Innovation Group (MEIG), Tech CEO and Red Raider Startup. Interested students should focus on exhibiting a strong work ethic and enthusiasm for innovation, entrepreneurship and leadership. There also should be a healthy desire to propagate change that will benefit their communities and beyond, Kim said.